This article will explain the different types of NHL prop bets and tell you the best sportsbooks to bet each type at. Hockey betting isn’t just about picking who will win the game. We covered that in another article about all the different types of NHL bets, but this one will talk more about props. With NHL prop bets, you can bet on certain things to happen during tonight’s games, like whether Henrik Sedin will score a goal or whether the Senators will score the first goal of the game. Or you can bet on who you think will win the Stanley Cup months from now. Let’s get into all the different types of NHL prop bets you can make, and a bit more info about them. This is when you bet on who will win the Stanley Cup. The odds change on a daily basis, depending on who’s hot and who’s not, injuries and other factors. Betting on Stanley Cup futures odds can lead to a big payday if you’re right. Even the Stanley Cup betting favourite usually pays 8:1 or higher, and some darkhorses pay in the 20:1 range. Bet365 usually has Stanley Cup futures odds among its NHL prop bets. Visit www.bet365.com, click on hockey on the left side of the screen, scroll down to NHL Futures and then click on ‘To Win Outright’ to bring up the Stanley Cup betting odds. This is like the Stanley Cup futures odds, except you’re picking who will win the Eastern Conference or Western Conference. Since it’s one less round teams need to win, the conference odds don’t pay as well as the Stanley Cup betting odds, but it’s a safer NHL props bet as well. You should be able to find the conference betting odds pretty easily at www.Sportsinteraction.com. Click on hockey in the menu on the left, then click on NHL Futures to bring up all of Sports Interaction’s NHL futures odds. The conference odds will be under the Stanley Cup betting odds. You can also bet on who will win the Atlantic Division, Central Division, Metropolitan Division or Pacific Division. Instead of worrying about the unpredictable playoffs, NHL division betting is based on the regular season. There’s only 7 or 8 teams in each division, so you should have a pretty good chance of picking a winner. You can usually find division betting odds at www.Betonline.ag. Click on sportsbook, go down to Futures & Props, and then click on NHL Futures. Instead of betting on who will win the Stanley Cup or who will win divisions, you can bet on teams to just simply make the playoffs. It’s a safer NHL prop bet so it pays a bit less, unless you bet on teams that are outside the playoff picture and hope they get on a hot streak to make it into the postseason. Not all sportsbooks offer this bet, but we’ve often found NHL playoff betting odds at www.Bet365.com. Unlike all of those other props, these NHL props will be settled during tonight’s game. It’s a totally different way of betting on games: instead of relying on a team to perform well (or to not), you can bet on individual players instead. 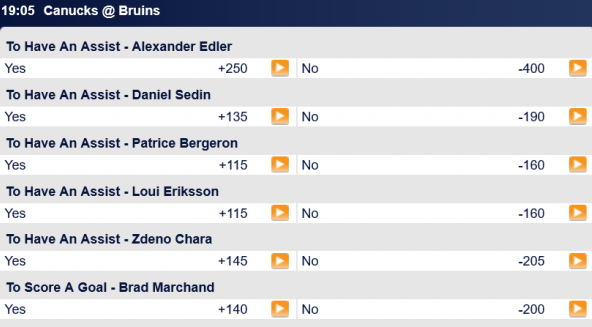 Bodog is one of the best NHL sportsbooks for these types of NHL prop bets. When we wrote this article, we looked at that night’s Bodog NHL props and found 112 different ones! Including whether Justin Faulk would get over or under 3 shots against the Rangers, or if Michal Neuvirth would make over or under 27.5 saves against the Avalanche. That’s a great way to make the game more fun. Game props are also fun to bet, and they’re a bit easier to predict than player props. You can bet on who will score first, whether the team that scores first wins, whether both teams will score, whether the total number of goals scored in the game will be odd or even, and more. Again, Bodog is your place for these kinds of bets. 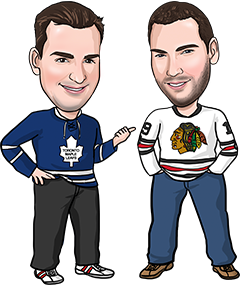 They had 99 different NHL Game props bets the night that we wrote this article. Head over to www.bodog.eu (www.bovada.eu in the United States) and check them out. Want a team to cheer for in the Stanley Cup playoffs, but not sure who to pick? Sports Interaction has really fun NHL prop bets in which they give you a random pick for the Stanley Cup winner at guaranteed 25:1 odds. Check out Sports Interaction for more details.